The biblical account of the parting of the Red Sea has inspired and mystified people for millennia. A new computer modeling study by researchers at the National Center for Atmospheric Research (NCAR) and the University of Colorado at Boulder (CU) shows how the movement of wind as described in the book of Exodus could have parted the waters. The computer simulations show that a strong east wind, blowing overnight, could have pushed water back at a bend where an ancient river is believed to have merged with a coastal lagoon along the Mediterranean Sea. With the water pushed back into both waterways, a land bridge would have opened at the bend, enabling people to walk across exposed mud flats to safety. As soon as the wind died down, the waters would have rushed back in. The study is intended to present a possible scenario of events that are said to have taken place more than 3,000 years ago, although experts are uncertain whether they actually occurred. The research was based on a reconstruction of the likely locations and depths of Nile delta waterways, which have shifted considerably over time. The study is part of a larger research project by Drews into the impacts of winds on water depths, including the extent to which Pacific Ocean typhoons can drive storm surges. By pinpointing a possible site south of the Mediterranean Sea for the crossing, the study also could be of benefit to experts seeking to research whether such an event ever took place. Archeologists and Egyptologists have found little direct evidence to substantiate many of the events described in Exodus. The work, published in the online journal, PLoS ONE, arose out of Drews’ master’s thesis in atmospheric and oceanic sciences at CU. The computing time and other resources were supported by the National Science Foundation. The Exodus account describes Moses and the fleeing Israelites trapped between the Pharaoh's advancing chariots and a body of water that has been variously translated as the Red Sea or the Sea of Reeds. In a divine miracle, the account continues, a mighty east wind blows all night, splitting the waters and leaving a passage of dry land with walls of water on both sides. The Israelites are able to flee to the other shore. But when the Pharaoh's army attempts to pursue them in the morning, the waters rush back and drown the soldiers. Scientists from time to time have tried to study whether the parting of the waters, one of the famous miracles in the Bible, can also be understood through natural processes. Some have speculated about a tsunami, which would have caused waters to retreat and advance rapidly. But such an event would not have caused the gradual overnight divide of the waters as described in the Bible, nor would it necessarily have been associated with winds. Other researchers have focused on a phenomenon known as “wind setdown,” in which a particularly strong and persistent wind can lower water levels in one area while piling up water downwind. 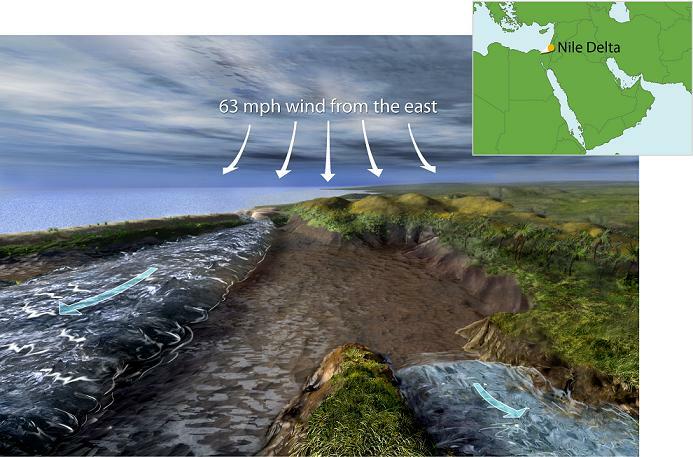 Wind setdowns, which are the opposite of storm surges, have been widely documented, including an event in the Nile delta in the 19th century when a powerful wind pushed away about five feet of water and exposed dry land. A previous computer modeling study into the Red Sea crossing by a pair of Russian researchers, Naum Voltzinger and Alexei Androsov, found that winds blowing from the northwest at minimal hurricane force (74 miles per hour) could, in theory, have exposed an underwater reef near the modern-day Suez Canal. This would have enabled people to walk across. The Russian study built on earlier work by oceanographers Doron Nof of Florida State University and Nathan Paldor of Hebrew University of Jerusalem that looked at the possible role of wind setdown. The new study, by Drews and CU oceanographer Weiqing Han, found that a reef would have had to be entirely flat for the water to drain off in 12 hours. A more realistic reef with lower and deeper sections would have retained channels that would have been difficult to wade through. In addition, Drews and Han were skeptical that refugees could have crossed during nearly hurricane-force winds. Studying maps of the ancient topography of the Nile delta, the researchers found an alternative site for the crossing about 75 miles north of the Suez reef and just south of the Mediterranean Sea. Although there are uncertainties about the waterways of the time, some oceanographers believe that an ancient branch of the Nile River flowed into a coastal lagoon then known as the Lake of Tanis. The two waterways would have come together to form a U-shaped curve. An extensive analysis of archeological records, satellite measurements, and current-day maps enabled the research team to estimate the water flow and depth that may have existed 3,000 years ago. Drews and Han then used a specialized ocean computer model to simulate the impact of an overnight wind at that site. They found that a wind of 63 miles an hour, lasting for 12 hours, would have pushed back waters estimated to be six feet deep. This would have exposed mud flats for four hours, creating a dry passage about 2 to 2.5 miles long and 3 miles wide. The water would be pushed back into both the lake and the channel of the river, creating barriers of water on both sides of newly exposed mud flats. As soon as the winds stopped, the waters would come rushing back, much like a tidal bore. Anyone still on the mud flats would be at risk of drowning. The set of 14 computer model simulations also showed that dry land could have been exposed in two nearby sites during a windstorm from the east. However, those sites contained only a single body of water and the wind would have pushed the water to one side rather than creating a dry passage through two areas of water. “People have always been fascinated by this Exodus story, wondering if it comes from historical facts,” Drews says. “What this study shows is that the description of the waters parting indeed has a basis in physical laws."